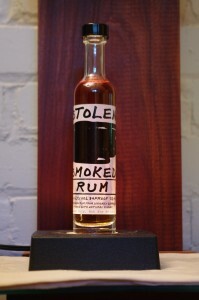 Notes: Stolen Smoked Rum is a Trinidadian Rum the kind of rum favored by Pirates and Sailors in the early period of sailing where it was even more grim than the conditions the deckhands on a tramp freighter have today ( or the engine crew on a Princess Line Cruise ship). 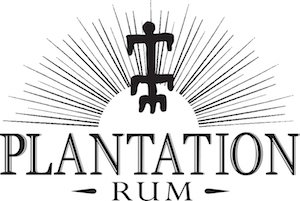 In another attempt to bring back an interesting and virtually extinct type of spirit a spiced rum that does not taste like baking spice and sugar and not Captain Morgan. Spiced rum of various types served a purpose, back in the day, it preserved the spices and covered up the faults in a cheap rum and provided a way of making a cocktail of a sort. This one also provides some interesting flavors to start mixing from with a minimum of effort. Appearance: Clear, caramel colored, on swirling it leaves a medium coat with legs rapidly forming. First Impression: A coffee and caramel bomb, with Morrocan Fenugreek and some Madagascar vanilla thrown in on top. Taste: Burnt coffee, wood charcoal and sugar in an unholy mix. Bitter ash type taste, like what your mouth tastes like after a hard night out, with or without Keith Richards as your wingman. Drinks: It can actually form a base for some drinkable cocktails, but on its own, it is a horror. Think of it as a Scotch and you can do something with it. 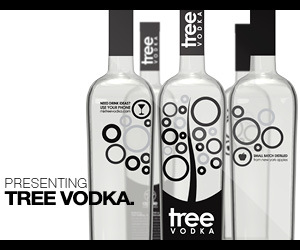 Bottle: Slightly unusual elongated cylindrical clear glass bottle with a slightly heavier decanter type punt. The labels that look like they were made with a sharpie. Plain screw cap closure. Final Thoughts: If you like smoke and charcoal you will love this, otherwise avoid it. Mildly amusing and somewhat informative with information on products and where to buy, both local and online.